In this article, I want to speak about another fantastic Airbrush from Badger. The Renegade Krome RK-1 Airbrush. 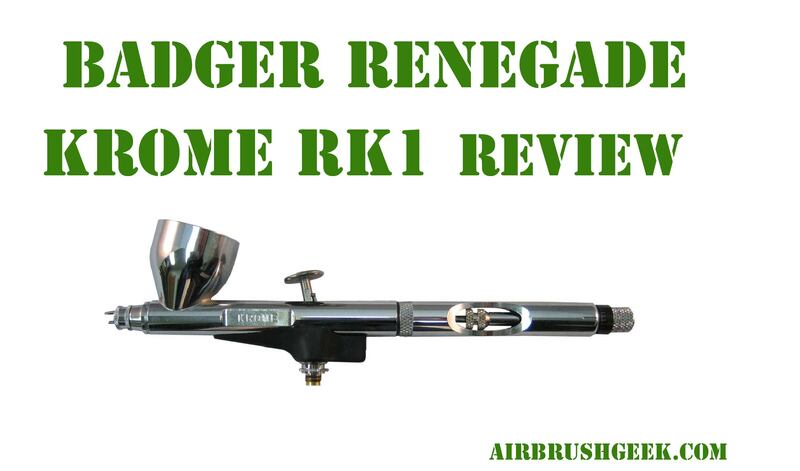 The Renegade Krome RK-1 Airbrush is the modified and improved version from the original Renegade Airbrush. The Badger Renegade Krome is a dual action, internal mix, gravity feed airbrush.With its very fine .21 needle, the renegade Krome is the ideal airbrush if you want to work on fine details. The Badger Renegade Krome comes in a very nice black and aluminium storage case with reinforced steel corners. As I already mention in my other Badger Airbrush reviews, I like having boxes to store my Airbrushes and keep my working area tidy. The Badger Renegade Krome comes 3/8-ounce mounted colour cup, a spare needle and nozzle. It comes with a protective rubber cap for the needle and a metal lid for the cup this time rather than the plastic one that comes with the Badger Patriot 105 for instance. In the box you can also find a hose adapter to fit with a standard 1/4″ hose and spray regulators for the two types of needle. The Badger Renegade looks very nice with its chrome finished (as opposed to the Renegade Velocity gunmetal finished), all parts are well manufactured, and it feels very comfortable and also well balanced in hands. Careful cleaning and maintenance of your airbrush is essential if it is to continue to work effectively. I will always recommend to dismantle and lubricate your airbrush before the first use. You will really feel the difference when using a well-oiled trigger mechanism, will make everything even more smooth. You can check price this following REGDAB Airbrush Lubricant . The Renegade Krome has a cut out handle on the back that will allow you to remove the needle without taking the handle off. I like this feature from the Badger Airbrush that make the cleaning and the maintaining much easier, saving you some precious time that you will be using to work on your project instead! I really feel that taking apart the badger Renegade Krome won’t cause you any trouble. All the airbrush’s parts are just to be finger tight to work to perfection. No need of plier or any other tool. Please take extra attention though while dismantling/amassing the Airbrush not to lose the tiny little spout /paint tip. The part is very tiny and can easily be lost. The extra fine needle will allow you to produce very fine lines, as thin as an hair all the way down to 1/1000ths of an inch! If you blend your paint property, the Badger Renegade Krome will produce very thin lines. Ideal for detailed work or for weathering if you are into model painting. The Badger Renegade Krome has a needle limiter with graduate markings collar with a set screw that will allow you to adjust the needle position by tightening or untightening it. You won’t need to worry about pulling the trigger back too far with this feature. The Badger Renegade Krome Airbrush performs realy like the original Renegade Airbrush as far as the spraying capabilities, which is superb really. If you are looking for an airbrush that will allow you to spray some great details, I can only recommend this airbrush id for you. Yet another great Airbrush from the Badger Company. I have personally own a Renegade Velocity for many years and I must say that I could not be happier with it. I was really curious to see how the Krome could possibly surpassed it. The answer is that Badger has managed to create an airbrush at a very affordable price that has managed to keep all the Velocity strong points, but also have managed to take into consideration user’s feedback to improve the airbrush even further, especially with the new trigger system. Overall, I am particularly happy with this badger Krome Airbrush and I can only highly recommend it to you.